Welcome to 2888 Brandywine Drive, a luxury estate just 30 minutes from downtown Portland, Oregon. Owned by an Interior Designer and Classical Feng Shui Practitioner, this home has been designed and built to maximize its Feng Shui balance, the benefits of which are palpable as soon as you walk through the welcoming front door. 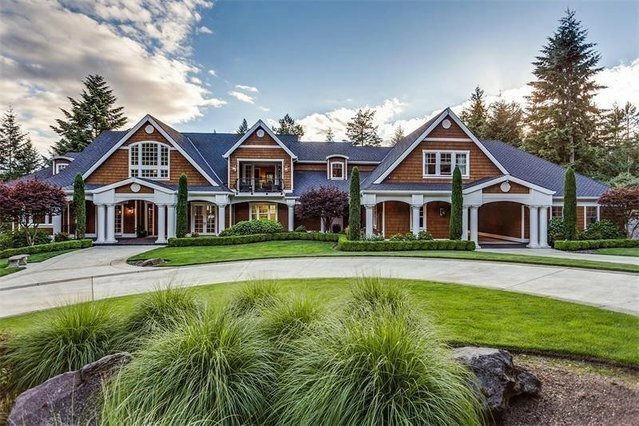 Nestled on two beautifully landscaped acres in the hills of West Linn, this 10,042 sq. foot home is built for family, for entertaining, and for making memories. At the end of a quiet street, wrought iron gates mark the entrance to this beautiful property. Warm days in the salt water pool will become warm nights dining under the stars, where family will gather for celebrations and even an ordinary weeknight meal will feel special in the gourmet kitchen. A long, private drive circles in front of this New Traditional Shingle style home and leads to a broad walkway leading to the welcoming front door. A covered portico with statement cedar ceilings, supported by thick white columns, beckons guests inside to the two-story foyer where one can look all the way through the living room, to the pool's feature wall that is uplit with an LED themed option lighting system. To the left is a den/office with custom wall to wall built-in book shelves and floor to ceiling French door styled floor to ceiling windows. To the right is the formal dining room that features double coffered up lit ceilings highlighted with crown molding. The French door styled floor to ceiling windows provide a glimpse into the vibrant hydrangea and boxwood garden. It's the living room however, that will draw guests further into the home. Two story vaulted ceilings soar overhead with dark beams spanning the expansive space. Two fireplaces flank the room. On one side, a crisp white mantle is topped with a Brazilian cherry hood and surrounded with stone. Built-in custom cabinetry with ample storage and display on either side of the fireplace, conveniently camouflages a television when not in use. On the other side of the room, a see-through fireplace divides the living room from the kitchen and informal dining space. Three sets of French doors topped with large windows lead out to the patio, the outdoor kitchen and salt water pool, creating an easy flow for indoor/outdoor entertaining. The outdoor space was inspired by a luxury beachside resort in Mexico and includes a pool and spa, a diamond glass feature fire pit with seating perfect for moon gazing, an outdoor kitchen with a Fisher & Paykel grill, bi level granite bar counters and a warm stone fireplace. Cedar planks line the ceiling of the covered patio providing a cozy outdoor living room on cool evenings. This extremely private property, boasts +/-15,000sq ft of exterior concrete flatwork. The large concrete courtyard / motor court, once used for a wedding on site, sits to the side of the outdoor kitchen and would be ideal for a sport court or children's play area. Mirroring the living room, the kitchen also has a set of three French doors that lead in from the outdoor kitchen and patio and into the informal dining area. The kitchen is a large, open space centered around a huge island with an elevated breakfast bar that seats five. A Wolf five-burner cooktop and a sink are housed in this L-shaped island. The custom cabinetry is crisp white and designed with all sorts of clever storage options, including a bar in the cabinet on the side of the fireplace. Double ovens, a dishwasher and a Sub-Zero cabinet front refrigerator area are also housed near the island. The kitchen also contains a butler's pantry that includes a metal farmhouse sink, a 2nd dishwasher and beverage refrigerator. Down the hall from the kitchen is a food pantry with secondary refrigerator, a storage pantry as well as a kids activity room with a half door for easy supervision. The homeowner, who is an Interior Designer and avid entertainer, currently uses this space to house all her entertaining décor. This room has great potential to be transformed into a wine cellar. The laundry/project room includes a washer and dryer, sink, gift wrap center, large island with drop down sewing machine, 2 work stations and ample storage. On the opposite side of the main floor is the master suite. This serene space includes a sitting area with a gas fireplace with private access to the back patio, pool and spa. The luxurious ensuite bath has heated travertine floors, walk-in shower, corner soaking tub, two separate sinks and a dressing table. The walk-in closet has built-in organization and its own laundry. In addition to the master on the main, this elegant home also offers a large en suite guest bedroom on the main, which is perfect for guests who are not able to manage stairs. Upstairs is a quiet secondary living room with a wet bar and a media room with room for custom leather recliner seating, a pool table as well as a game/puzzle table. Also upstairs are two oversized guest bedrooms, each with their own ensuite bath and walk in large closets. Currently the 4th large en-suite bedroom is the converted original pair of Jack and Jill bedrooms, which can easily be converted back, to increase the number of bedrooms on this level to three. The guest house on the lower level, has both access through the main house via a hidden door near the living room, as well as its own private entrance and parking. Designed to enable multigenerational living, the guest house is fully self-contained with a complete kitchen that overlooks the French garden, laundry room, bedroom with ensuite shower and a wonderful deep reading nook. Tall 10 foot ceilings, windows on three sides and designer touches, ensure that this space feels open and spacious. A yoga studio/workout space with mirrored walls, ceiling fans and a television, as well as a bath with a steam shower are also on this level and are shared with the main house. This home's location is both extremely private - feeling as if it is a country retreat - while at the same time it is extremely convenient - just a short walk, bike ride or drive to shops. Consistently ranked one of the top Oregon places to live, West Linn is located just 25 minutes from downtown Portland, its location is ideal for commuters with easy access to both I-205 and I-5.